Have you ever wanted to keep the members of a SharePoint group in sync with those of an Active Directory Group? If so, you’re in luck, I happen to have just such as script. Just a quick note, this was written for and tested on a 2010 site – in 2013, the default authentication is Claims – those funny looking strings like this: “i:0#.w|domain\user” (more info here) and you’ll need to work this script over a few times to make that work. That said, this script will keep a SharePoint group in sync with an AD group. That is to say, if the AD group has extra users that aren’t in SharePoint, they will be added to SharePoint. 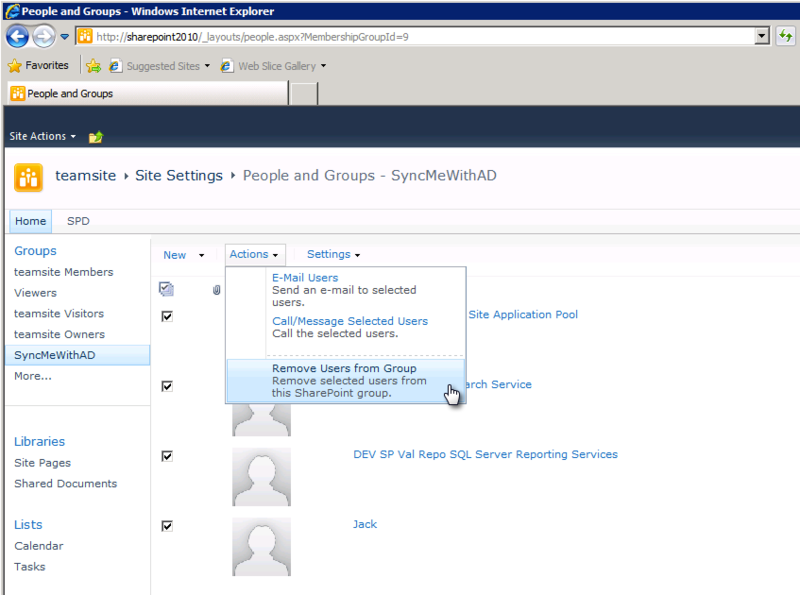 If a user is removed from the AD group, they will also be removed from the SharePoint Group. If a user is added to the SP Group, but isn’t in the AD group? They will be removed from the SP group. This is one of those scripts that makes sense to run as a scheduled task once you get it working. If you need help with that, see my post: Schedule your PowerShell scripts using the Windows task scheduler. 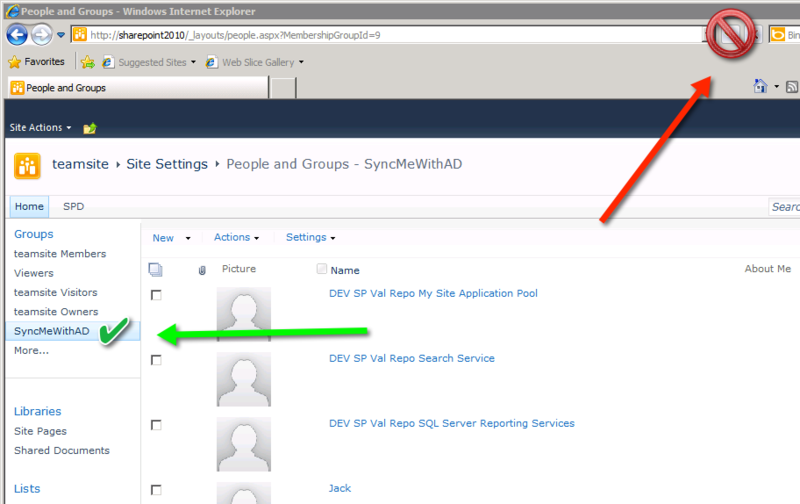 #note that the AD PowerShell Commands must be installed on the SharePoint Server for this to work. # we need the name of the AD Group, the name of the corresponding group in Sharepoint to sync with, and the URL of the SPWeb where the SP group resides. write-host "Debug: at this point we should have a list of user ID's from SharePoint in domain\user format, uppercase"
write-host "Adding all AD group members to the SP group"
write-host "Comparing AD Group Users to SP group Users"
Write-host "Result of comparison is:"
Write-host "Looking for users in AD that we need to add to SharePoint"
write-host "Adding $($missingSPUser.LoginName) to sharepoint"
write-host "Looking for Extra users in SharePoint that are not in AD"
write-host "Removing $($extraSPuser.LoginName) to sharepoint"
#Domain name should be the first DN= Entry from left to right. When you test the code, you might make a mistake I made during development – I’ll share that mistake with you to save you an hour of time and some frustration. While testing, I wanted to try adding users to an AD group and wanted to make sure they added in correctly. For one test I wanted to remove ALL the users from the SharePoint Group, and confirm that they came back ok. I then ran my Super Awesome AD Sync PowerShell Script which Added the groups back in. Now here’s where it got ugly. When I checked the UI, they weren’t there. Recall that the very last thing I did was remove users using that screen. Now interestingly, you know how we all click “OK” on a screen without paying attention? I was refreshing the delete in the UI! Pay attention to dialog boxes, they may save you an hour. Don’t ever click ‘refresh’ after performing a delete! Hi Jack- thank you for the great site and the fantastic SP/AD synch script. I just wondered if there is something like this possible for sharepoint online – Powershell online management as many of the cmdlets for onprem are not available for online but thought it worth asking if something similar is possible. Thank you for any help/advice you can give. Hi Adam, I believe so, there are a few commandlets for adding users to a sharepoint online site/group, and I think you can enumerate through the current group users similar to how we do it on premise, (using the appropriate SPO commands). I’ve not done this yet, but if I do, I’ll be sure to update the site. Hi Drag, sorry for the late reply. As I understand it, the script above works with claims with a slight modification to take into account the structure of the claim. I’ve not needed it but a peer at another company said he was able to alter it pretty quickly to work with claims ID’s instead of Domain\userID.